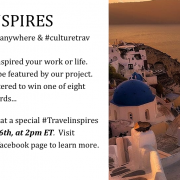 This Wednesday – and for the entire month of April – #CultureTrav is teaming up with Anywhere Workday. In light of recent world events, we are talking about how travel inspires us using the hashtag #TravelInspires. The chat will take place today at 2 p.m. EDT / 8 p.m. CET. We want to create a deeper connection and truly discover how travel can make this world a better place. Thank you to Anywhere Workday for allowing us to join this inspiring initiative! We are looking forward to hearing all of your stories and perspectives later today. Books, books, books! When I was little, I used to stay up all night reading, practically devouring novel after novel. Not much has changed now that I’m an adult. I enjoy reading in my spare time and am even part of a book club here in the Netherlands. Additionally, I am a writer and soon-to-be author and have many writer friends. Therefore, when Erik Scalavino suggested we talk about books for an upcoming #CultureTrav, I was all in. The discussion on Thursday, March 24 was inspirational! It is great to see so many book lovers in the world, especially those that love to travel, too. Following the chat, I compiled the names of all the books and authors mentioned, listed in this post.